The What Car? Used Car of the Year Award winners have been announced. You can argue that the Irish market is similar to that of the much bigger UK in the availability of models and which cars that motorists like. You can equally argue that Irish motorists have a different order on their priorities when choosing a used car. Whatever your opinion is, the WhatCar? Used Car Awards do get you thinking and maybe looking beyond your existing boundaries about what you like or don’t like. This year, the Seat Leon hatchback fended off stiff competition from 14 other winners to be named the best used car on UK forecourts today. Introduced in 2013, the latest iteration of Seat’s family hatchback attracted plaudits for its combination of driving dynamics, quality, safety and kerb appeal. In the family car category, the Leon came in ahead of the Kia Cee’d and Ford Focus. Audi also proved successful, with the Audi Q7, Audi TT and Audi R8 taking the best used luxury SUV, best used coupe and best used sports car titles respectively. However, the Leon managed to beat its Audi A3, Volkswagen Golf and Skoda Octavia siblings as the only one of the quartet to feature in the shortlist. The 15 What Car? Used Car of the Year Winners were categorised into age groups to reflect the choice available on the used car market. The final decision on winners was taken by a panel of experts, based on the main criteria of quality, reliability, value and the availability of desirable versions with the Leon coming out on top. 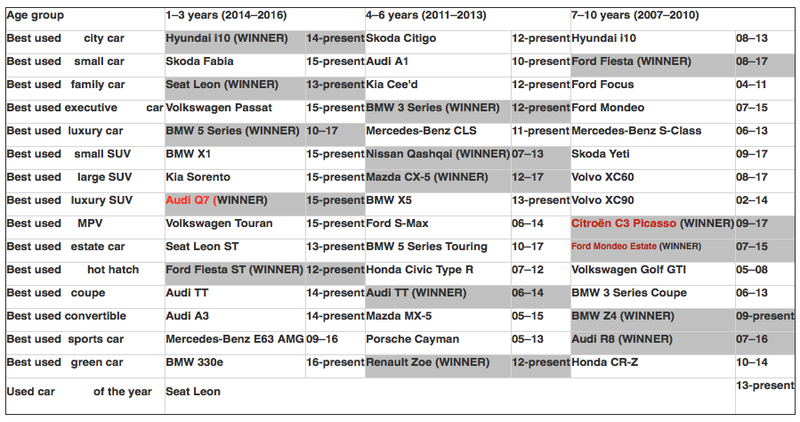 Other notable winners were Ford and BMW, each taking three category wins. Renault’s electric Zoe supermini celebrated its fifth birthday this year, and was named the victor in the green car of the year category as the latest generation of EVs become attractive used propositions.